KITsubs: Kamen Rider episode 41! 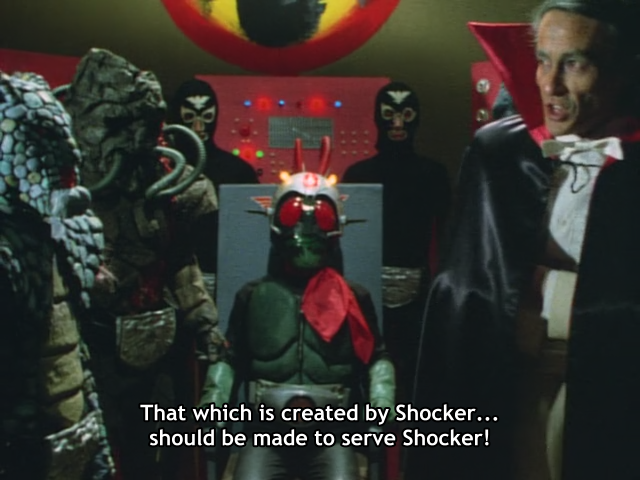 Shocker continues their plan to cause the Sakurajima volcanic region to erupt with a massive magma overload, but now they've got a new facet to their schemes. They've decided to take back what's theirs... Kamen Rider 1! Will the succeed? You'll have to watch and find out! This marks one of the many times where we see previously-exploded Shocker Cyborgs come back to fight like its no big thing. Don't worry, we'll see it happen with Riders too. Sometimes you can't keep a good mechanical beast down, so Armadilong and crew are back to throw hands once again. This is also the end of Hongo's "return" arc. Don't worry, we'll see him again soon. But for now, it's still Ichimonji's show. And with that, we're getting our next release ready for you. Be sure to check back soon for more classic Tokusatsu action! yes!!! !Thank you JEEG for the early birthday present! I'm totally going to wait until birthday until watching it!! thanx buddy!!! super excited!!! I thought this might be of some use to you whenever you sub the rider movies. Just wanted to thank you guys for all your hard work. I hope y'all finish subbing the entire series - it's been a blast so far. Just thought you should know that there are plenty of people who appreciate the effort.